to stimulate the skin to regenerate itself. At the same time, we deliver a combination of peptides, vitamins and hyaluronic acid (specifically tailored to your needs) deep into the skin to induce collagen production. We love this treatment because it can be used for all skin tones and improvements are usually visible within 24 hours. To get maximum benefit we usually recommend a course of 3-5 treatments in total (with a 4-6-week interval between each). 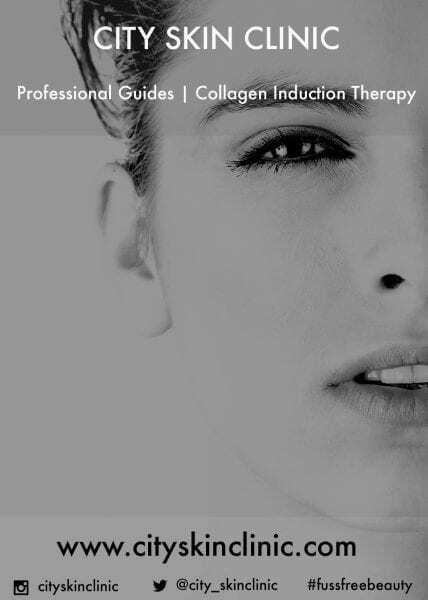 Click here for a concise guide to our Collagen Induction Therapy treatments. If you have multiple skin targets that would benefit from skin resurfacing as well as microneedling, our combination therapies may be the answer. We can combine Collagen Induction Therapy with a course of chemical peels. These two treatments work in synergy to restructure and regenerate the skin. Collagen Induction Therapy also compliments and boosts the results of other skin reviving treatments like Botox and dermal fillers. Like all our treatments, we perform a detailed consultation then design a protocol and treatment plan based on your needs. If you're interested in learning more about microneedling, chemical peels or for more fuss-free skincare and beauty tips, visit our blog. The consultation fee is taken off the price of the treatment. Amazing results, courteous and professional. Will be back. Dr. Ibrahim is super nice and the service provided at city skin clinic is superb! Can't recommend enough! What does the treatment involve and will it hurt? Prior to treatment we will prepare your skin with a gentle exfoliant then apply numbing cream to the area. Once the skin is numb, Collagen Induction Therapy is performed using microneedling with a dermaroller device that penetrates the skin with hundreds of tiny needles. As the skin has been anaesthetised, you will not feel pain (only touch or gentle pressure). We also deliver a micronutrient cocktail into the skin during the microneedling which has been put together according to your bespoke protocol. Are there any side effects to Collagen Induction therapy? At City Skin Clinic we place emphasis on safety. Firstly, we do not recommend this treatment for people who are on blood thinning medicines. This is because they have an increased risk of bleeding and bruising. Similarly, we do not provide these treatment for people with a weakened immune system as they are at risk of infection. In addition we ask all our patients to follow the post treatment advise we give them to. This includes avoiding picking at the skin or excessive exfoliation straight after the procedure to prevent scarring. After the redness goes away you should start to see smoothing results within the first week. However, maximum results can take up to 6 weeks to see with continued improvement for several months as further collagen and elastin are deposited. In addition, to gain the full benefit from this treatment we recommend a course of 3-5 treatments for ageing skin. Moreover, problems like acne or stretch marks may require even longer courses. Hence it is important to be prepared to undertake a course of several treatments for more satisfactory results. Do I need to use any special creams or serums in between treatments? To get the most out of this treatment we recommend using a good moisturiser and Vitamin C serum in between treatments. We can provide you with advice on which products we recommend that can be purchased from any quality retailor. However, it is up to you whether you use them or prefer to continue using your own or another brand. Either way, we encourage a regular fuss-free skincare routine.